You are here: Home / Galaxy Note 5 How-to Guide / How to add app shortcuts to Galaxy Note 5 air command? 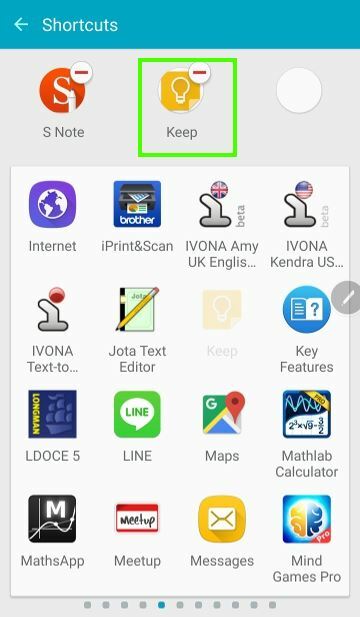 This guide shows you 3 different ways to add app shortcuts to Galaxy Note 5 air command, and how to remove app shortcut from air command in Galaxy Note 5. App shortcut is a new feature in Galaxy Note 5 air command. Even better, you can customize and add app shortcuts to Galaxy Note 5 air command easily. This guide shows you how to add and manage app shortcuts for air command in Galaxy Note 5. One of the notable new features in Galaxy Note 5 is that you can add app shortcuts to Galaxy Note 5 air command. This means you can slightly customize Galaxy Note 5 air command finally. The purpose of adding app shortcuts to Galaxy Note 5 air command is to launch the app quickly without fiddling around the apps screen or home screen. Galaxy Note 5 allows you add up to 3 app shortcuts to air command. Although you are free to add any apps in your Galaxy Note 5 to air command, you probably want to utilize this feature for S Pen related apps. By default, S Note was added already. You can add other note-taking apps, e.g., Google Keep, or some sketching apps (remember you can download the full version or Autodesk SketchBook for Galaxy from Galaxy Apps) and photo editing apps. To add app shortcuts to Galaxy Note 5 air command, you have 3 different ways to access the settings. 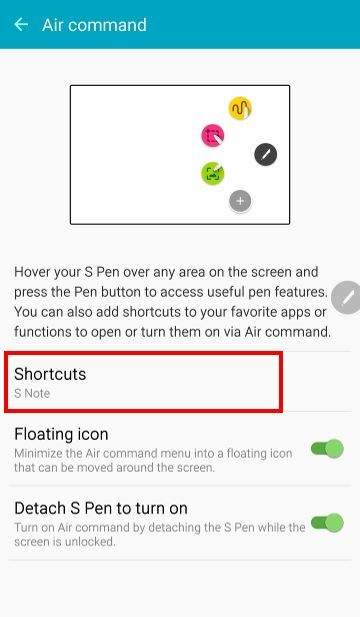 You can go to Settings—S Pen—Air command—Shortcuts as shown below to access the settings for you to add app shortcuts to air command in Galaxy Note 5. This method always works regardless of the status of the S Pen. 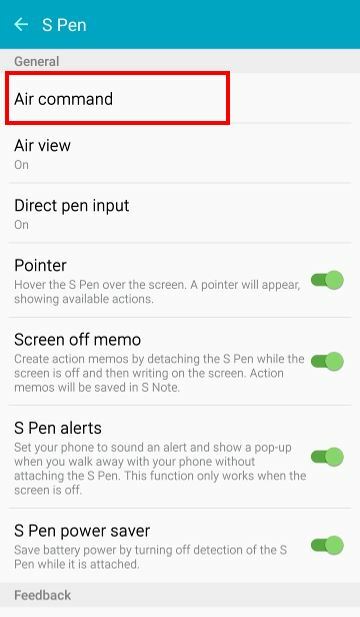 When S Pen is detached from Galaxy Note 5, you can launch air command in a few different ways as explained in this guide. In Galaxy Note 5 air command interface, you can find the Settings (gear icon) icon in the bottom left as shown below. Tap this Settings button to enter Settings—S Pen —Air command page as shown above for method 1. You can then proceed to add app shortcuts to Galaxy Note 5 air command (read on). As shown above, in Galaxy Note 5 air command interface, there is a + (in a circle) button. This is the add app shortcuts button. This add app shortcuts button appears if there are less than 3 app shortcuts added to air command in Galaxy Note 5. If you already added 3 app shortcuts, this button will disappear. Tap the button will directly bring you to Settings—S Pen—Air command—Shortcuts. In Settings—S Pen—Air command—Shortcuts page, as shown below, you can notice there are 3 spots on the top. These are the locations for you to add app shortcuts to Galaxy Note 5 air command. All apps in your Galaxy Note 5 are listed below these 3 spots. You can swipe left or right to other panels to find other apps. Tap any apps to add it to Galaxy Note 5 air command. 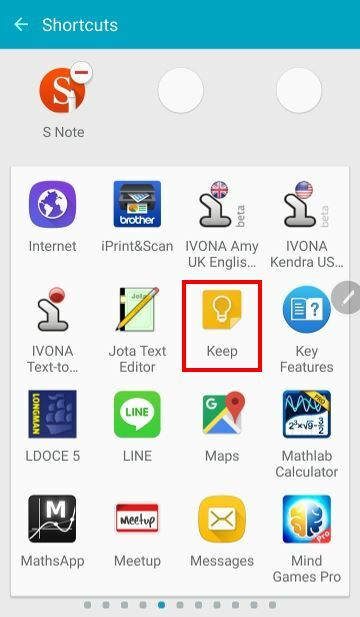 For example, you want to add Google Keep to air command in Galaxy Note 5. Tap Keep icon as shown below. The Google Keep now occupies one spot on the top. This indicates Google Keep now is accessible from Galaxy Note 5 air command. 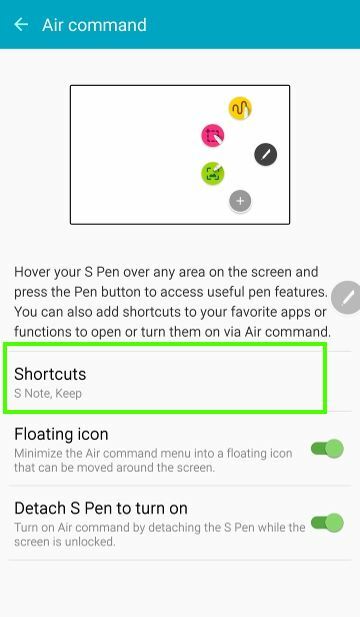 In Settings–S Pen–Air command page, under shortcuts, you can notice S Note and Keep are listed as shown below. 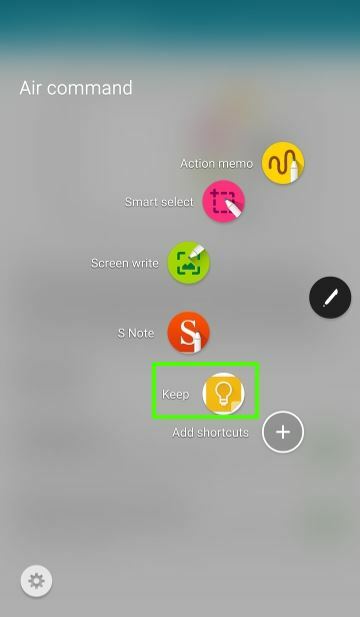 If you open air command in Galaxy Note 5, you can find Google Keep icon is next to S Note as shown below. This means you successfully add app shortcuts to Galaxy Note 5 air command. You can repeat the processes to add another one if you want. 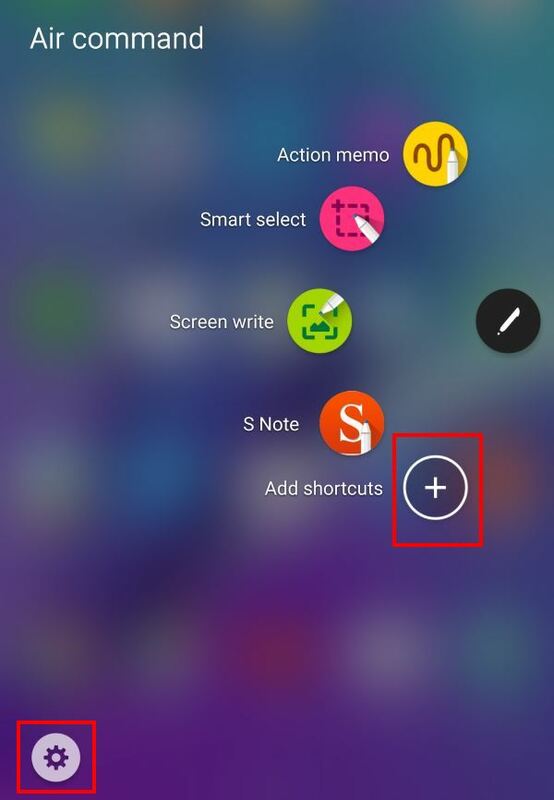 How to remove app shortcuts from Galaxy Note 5 air command? You can manage the app shortcuts in Galaxy Note 5 air command easily in Settings—S Pen—Air command—Shortcuts page. Just tap the app icon in one of 3 spots to remove the app from Galaxy Note 5 air command. Actually, the “-” icon next to these icons gives you the hint. This is similar to that in Galaxy Note 5 apps screen. Can you add app shortcuts to Galaxy Note 5 air command now? If you have any questions or encounter any problems to add app shortcuts to Galaxy Note 5 air command, or to manage app shortcuts for air command in Galaxy Note 5, please leave a comment in the comment box below.